Rubber Soul is a medium-height curly haired man, with his Stand granting him the ability to grow larger and to change appearance at will. 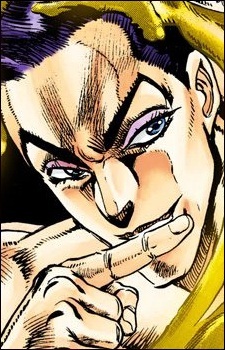 He was hired by Dio with the promise of earning 100 millions as a reward for killing Jotaro. Rubber Soul does, however, have a rather disturbing personality: he is extremely rude and impolite, showing no respect nor mercy for people and animals, as they are beings that he only sees as food for his Yellow Temperance. He does not seem to be particularly intelligent, though he has a really bad temper: he wanted to ambush Jotaro with Kakyoin's appearance, but his unusual behavior blew his cover. Rubber Soul is also very violent: he attempts to kill a pickpocket by breaking his back, and remorselessly eats a dog under the eyes of its master with his Stand. In order to grow bigger, he did not hesitate to eat bugs either.